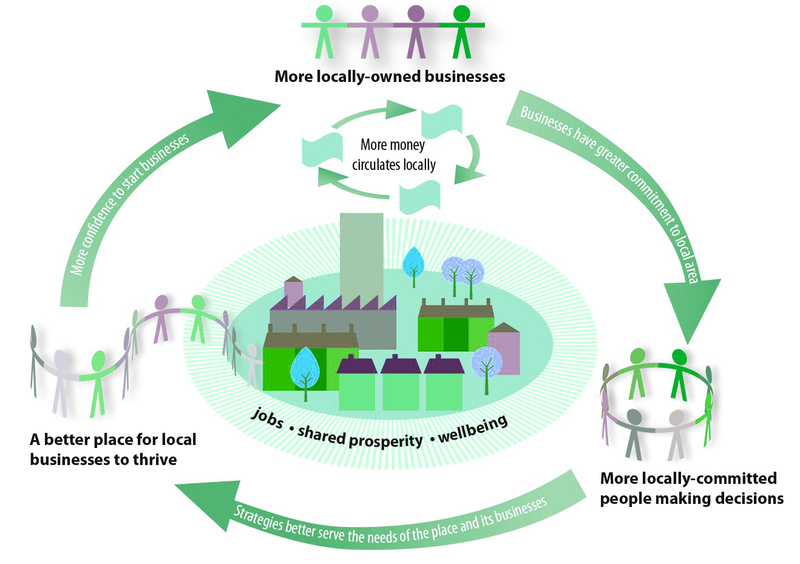 LWM’s research concluded that higher levels of small business and local ownership lead to higher levels of economic success, job creation, social inclusion, civic engagement, wellbeing and local distinctiveness, and this virtuous circle explains how. So we can realise local economic power rather than handing it to ‘absentee landlords’ i.e. distant private and public sector owners with little understanding of the local area. Is this about community or about business and the economy? Both, inseparably. This is not about small community projects but about maximising the local benefits of all economic development. Rather than economic development being “done to” an area, local people lead and participate as owners, investors, purchasers and wealth creators. See our case studies, the evidence, or some guidelines for taking action. Community Economic Development (CED) is about local people using local resources to enhance economic opportunities and social conditions in a sustainable way. Mainstreaming community economic development (MCED) is about embedding the principles of CED and good practice across public, private and social sector organisations in a way that delivers the benefits of CED through core, day-to-day business rather than as a ‘special initiative’.